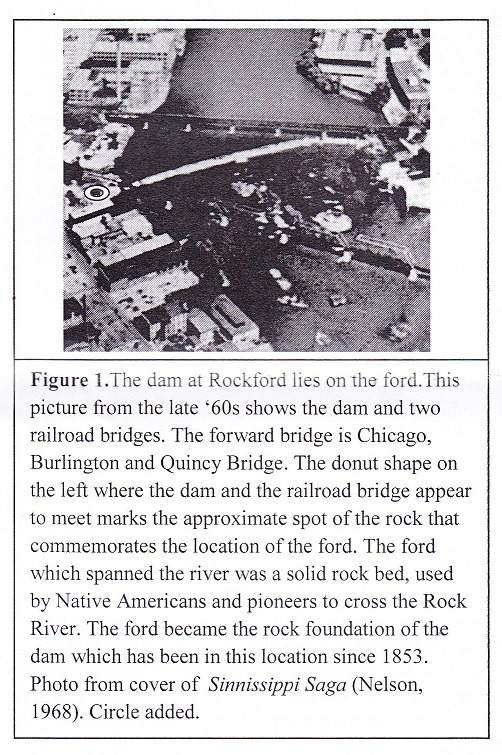 Carl E. Severin spearheaded the project to have a 2 1/2 ton boulder placed on the west side of the river to mark the location of the ford, for which Rockford is named. The boulder was donated by Frank Truman, Rockton, IL, from his farm on Illinois I75. The boulder was moved by Gregory-Anderson, Rockford, and the city of Rockford brought in the fill dirt for the area where the boulder is located. A bronze plaque with a historical inscription was added. The dedication was Thursday, October 28, 1965 at 4:00 p.m. Underneath the main plaque was a bronze plaque of an oxen-drawn covered wagon, which Mr. Severin had from Oscar Swanson. On August 26, 1966, the Rockford Morning Star newspaper reported that vandals nearly succeeded in toppling the boulder from its base. The boulder was put back into position, and cement was placed around the bottom of it. 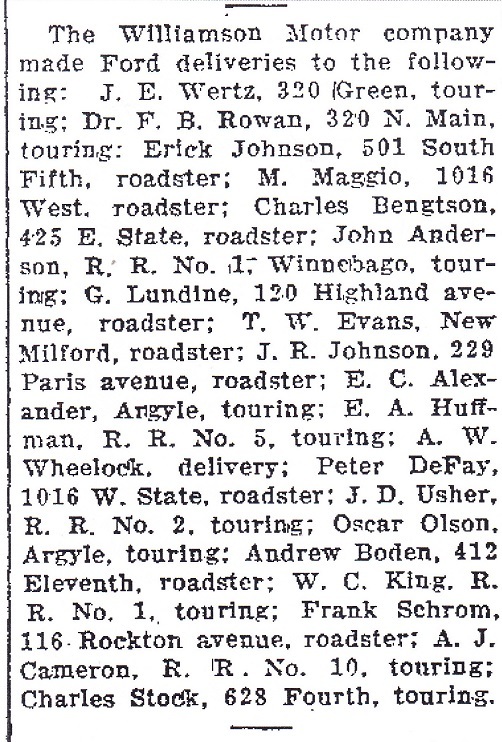 On July 18, 1969, the Rockford Morning Star reported that the bronze plaque was stolen. It has not been recovered. The ford was used by native American Indians. Their trails ran north, south, east and west from the ford. The ford was also used by others headed west, and by the stage coaches between Chicago and Galena from 1834 through the late 1840s. The flat rock bottom which was the ford is covered by the dam. John Thurston’s Reminiscences indicates that the rock forming the ford was flat as a floor and did not vary in depth over five inches. The water came up to the front axles of the wheels. 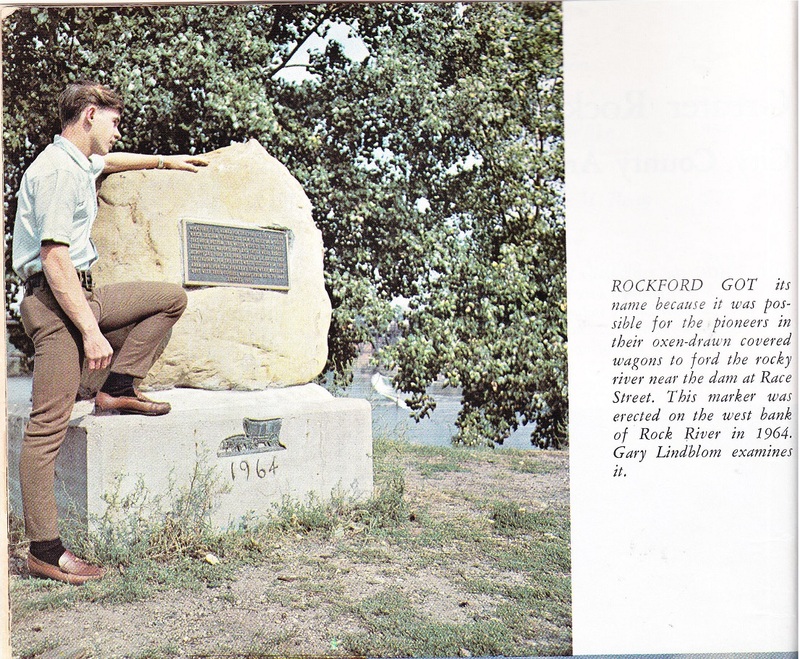 The photograph of the boulder is from Sinnissippi Saga; a history of Rockford and Winnebago County, Illinois, compiled and edited by C.Hal Nelson, 1968. Source: Sinnissippi Saga, C. Hal Nelson, 1968.